I posted this question to my Facebook group... now I am curious for your answers. Will also post the FB responses below too... 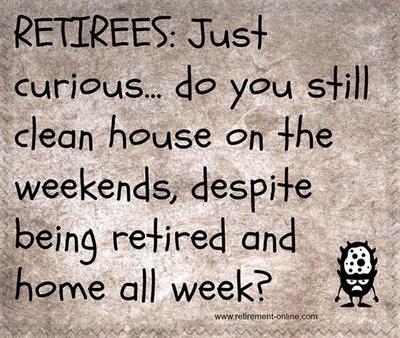 I am always curious about how people live retirement! Linda Stelter No I don't. NCPHS The Sequoias SF Cleaning house can be like cleaning the mind. It is good practice whenever. Do you leave messages to yourself: CLEAN ME! Donna Schulz no, I write HELLO in the dust! Betty Antibus who cleans? only if someone is coming over! THAT certainly is an incentive..
Norma Otto Loewen I clean whenever I trip and fall over something!!! Oooh, Norma, not a good thing, one fall and your injury could be life changing... I assume you are kidding? Oh Linda, SO Absolutely TRUE... the real retirement life! Love it too! Debi Tillis Clean it when it needs it now! Therefore, I work harder at it now than ever! Oh boy, Debi, you (quite obviously) should not be working harder in keeping your home clean... No! You need to find something better to do, and sneak in cleaning when you can! Life is waiting for you! Crisostomo Why the "Hell No" answer? Betsy McCullen I clean it when I think it's dirty enough (my standards for clean are pretty high!)! Now that it's good and clean, I can keep up with it so it never gets out of control like it did when I was working! Ann Gingell Bifoss I spread it out over the week. Susan Bobrow Aiken nope, during the week. Terry Wash Viazanko Hire a cleaning lady! Janice Kent Not usually. Try to so most everything during the week. Danice Faulkner What is 'clean house'? Vera Richard Not a chance! Sally-Os Tomkinson Not really, unless something unusual happens, like to save my weekends for church and fun! Mary Ziefle Quinn Nope! I do what I want, when I want! Pat Mazzacane No. 5 days is enough and it makes for a satisfying and busy Monday. Evanette Evans Olsen Yes and I'm not home all week , thank you ! David Cox Clean House ??? Oh yea, that is retirement!! Sally Harris I didn't clean house on the weekends when I was working!!! You lived a Good Life! Agree, Roberta.... I feel good in my home when it is clean! Feels and smells good too! William A. Schnur I clean whenever my wife wants me to. Sharon Loughman Story My retired hubby cleans all the time! Sharon My husband cooks, and thats wonderful. so lucky that yours cleans! woo hoo! Love it, Sad... but Love it! Cecilia Leary No, not any more. I don't have to do anything on the weekend if I don't feel like it. Good Retiree, do what you wanna do daily! Judy Neigel Blasi No way! Now it's whenever I get into the mood. ... and THAT is called Retirement, Judy! Good One! Donna Schulz I clean every six months or whenever the dust is deep enough to write in. As I walked into the drawing room on the morning of the 1st March, 2005, I was surprised by the faint fragrance of flowers. As I flicked on the light switch, I saw the bouquets of flowers arranged on the dining table, next t the packets of farewell gifts and mementos. These reminded me that this was the first day of my retired life. As I began to get dressed, I realized i had nowhere to go. it was then that the reality of retirement hit me with full force. My work in the college had kept more than half of my day fully regulated. Now I had to find something to keep me occupied during these hours, which till yesterday had been spent in the college and work related to the college. I walked over to the nearby park and was surprised to find that a reguar routine was already laid out for me.... three to five rounds of walk, gossip with others who had been retired for years, looking at the birds and the stray dogs that I had never noticed before, Yoga classes that I did not know were a regular morning feature, a laughter club that sounded both funny and attractive and a fruit seller's cart at the park gate that sold only such fruits that retired people wanted .... papayas,melons, guavas,cucumbers and green coconuts. In a day or two I came to discover that there were several separate gatherings of the retired people in the park .... those who talked on religion or politics or share market investments or health issues. There was a retired Under Secretary to the Government who advised people on post-retirement hassles. He quipped "you bring me the issue, I will give you the Rule." Almost ten years have gone past. During these years I have discovered many new avenues of keeping busy .... reading, writing and commenting on retirement-online.com, facebook, writing blogs and stories, listening to songs on YouTube. Getting my first computer and getting used to working on it has helped me. In addition to the fellow retirees in the neighboring park, I am now able to keep in touch with retirees around the world on retirement-online.com. The popularity of facebook among college students has meant that I am back in touch with many of my ex-students. i find retired life quite interesting.